On Thursday, July 19, 2018, two teams heading in opposite directions will square off when the 7-15 New York Liberty, currently 10th in the WNBA, travel south to take on the 13-9 Atlanta Dream, who are fourth in the league. New York is 3-7 in their last 10 games and they are 3-7 on the road this season. Currently, the Liberty find themselves 9.5 games out of first place, but they have been taking care of business in the conference, recording a 6-5 record. New York is averaging 79.2 points per game, shooting 43.3 percent from the field, and shooting 32.5 percent from beyond the arc. New York is allowing an average of 84.5 PPG, 44.6 percent from the field, and 35.3 percent from beyond the arc to opponents. The leader of the Liberty is still Tina Charles, who is averaging 20.0 points per game and 7.0 rebounds per contest, oath of which lead New York. She is second on the team and field-goal percentage at 45.2 percent and is hitting an average of 32.4 percent of her three-point shots. Charles is the only player on New York who is averaging double digits in scoring. There are 11 different players on this team averaging at least 12.9 minutes per contest. The leading playmaker is Brittany Boyd who is averaging 4.8 assists per contest. Atlanta is 7-3 at home this season and they are 7-3 in their last 10 games. 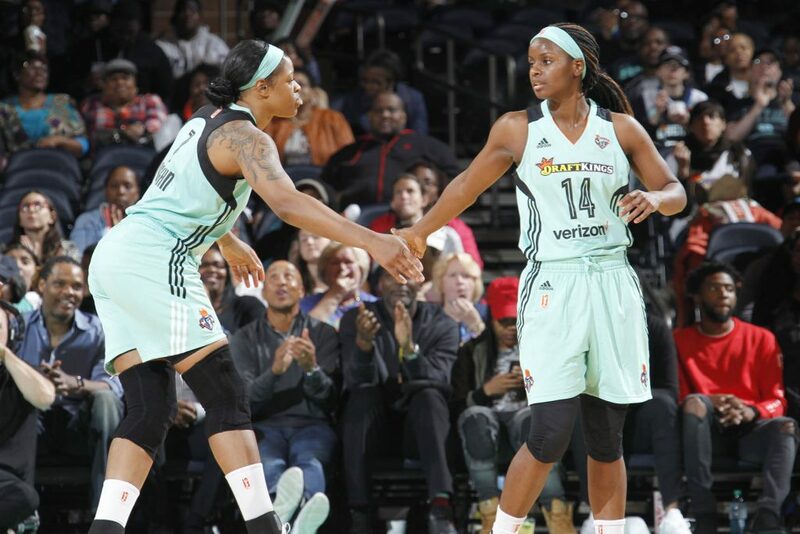 The Dream are 9-3 in the conference and trail the Seattle Storm by 3.5 games for first place. Atlanta is averaging 78.7 points per contest, is shooting 41.2 percent from the field, and 30.1 percent from beyond the arc. Opponents are averaging 79.6 PPG, 41.9 percent from the field, and 33.1 percent from beyond three-point range. Three different players are averaging better than 10 points per contest for Atlanta the season, led by Tiffany Hayes who is averaging 17.4 PPG. She is trailed by Angel McCoughtry, who is averaging 17.0 points per game. Hayes is shooting 45.7 percent from the field while McCoughtry if shooting 41.7 percent. Leading the team in rebounds is Jessica Breland at 8.3 rebounds per contest. The leading three-point shooter on the team is Renée Montgomery, hitting on 36.5 percent of her three-point attempts. Liberty are 5-2 in their last seven games against the spread against Eastern Conference opponents. Liberty are 5-11 in their last 16 games against the spread. Liberty are 1-4 and their last five games against the spread against teams with a winning record. Dream are 5-0 in their last five games against the spread. Dream are 4-1 against the spread in their last five games at home. Dream are 4-0 in their last four games against the spread following a victory where they cover the spread. In the last six meetings between these two teams against the spread, New York is 5-1. Look for Atlanta to win, but not cover the spread. Take the Dream, 79-74.